Looking for something striking to lighten up your cabinet, bookshelf, or fireplace mantle? These beautiful Teak candle holders hold a standard taper candle, and will provide a warm, comfortable appearance that will accent other furnishings anywhere they are displayed. 2 1/2" x 2 1/2" x 6 7/8"
Print out candle holder drawing and increase size with a duplicating machine until it is 6 7/8" tall. Transfer the enlargement onto a poster board, and use a pair of scissors to cut out the pattern. Start with a 1 1/2" x 3" x 29" Teak board, and use a jointer to joint one edge. Use a radial arm saw to cut the board in half. Glue the faces of each board together with wood glue and clamp together using three hand screw clamps. Clean up excess glue and allow to dry for 24 hours. Use a radial arm saw to cut two pieces each 7 1/4" long. Draw diagonal lines on one end of one of the pieces to locate the center. Mark the center with a scratch awl and cut 1/8" saw kerfs across the corners. Place a spur center in position with the saw kerfs and strike it with a mallet to seat it properly. Place the wood between the lathe centers and turn the tailstock handle until the cup center seats firmly on the wood. Release the pressure on the wood and apply a drop of machine oil, and then re-tighten the pressure. Adjust the tool rest to clear the wood approximately 1/8" with the top of the tool rest about 1/8" above center. Adjust the lathe speed to about 600 RPM. Use a gouge to cut the wood stock to a cylinder, and then use a square nose tool to turn the stock to approximately 2 5/8" diameter. With a pencil and a ruler mark the wood stock according to the shapes of the pattern. This procedure may have to be repeated from time to time as you shape the wood. The lathe should be set at its lowest speed for the markings. Set the lathe speed to 1000 RPM and use a parting tool to cut the stock to the appropriate diameters. Measure the diameters with an outside caliper. Use a skew to shape all beads. Also use a skew to cut V's, to cut to length, and to remove thin shavings from the sides. Use a round nose tool to cut concave shapes. Turn the speed to about 1000 RPM. Cut all shapes to proper diameter. Remove from lathe and cut length to 6 7/8". Set up turned stock on a drill press and clamp in a vertical position. Use a 1" Foerstner bit to drill a hole 1" deep at the top end. Note: This step should be performed after all the lathe work is completed. Remove the tool rest; turn on lathe and sand candle holder (A) thoroughly with 120 grit sandpaper. Repeat the sanding process using 220 grit sandpaper. Finish the sanding process using 400 grit sandpaper. Apply a liberal amount of Mylands high build friction polish to a rag, and with the lathe running, polish the candle holder. Apply pressure to the candle holder with the rag approximately two minutes or until a high sheen appears. Remove from the lathe and glue cork surface saver (B) onto the bottom of the candle holder. NOTE: Repeat cutting, sanding and finish procedures for the second candle holder. 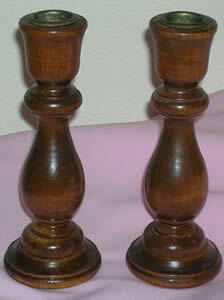 *Congratulations, your wood candle holders are finished and ready to use! Also learn how to make a coaster holder for your home or office.